Lake Erie, which forms Cleveland's northern boundary is the most shallow and the southernmost of the five Great Lakes. The lake provides transportation, employment, food, and recreation to residents of and visitors to Northeast Ohio. It is a bountiful resource and a source of endless fascination. Lake Erie was carved out by the receding glaciers of the Great Ice Age. Evidence of this may be seen in the Glacial Grooves on Kelleys Island, the largest accessible glacial grooves in the world. The area surrounding Lake Erie was originally inhabited by the Erie native American tribe, from whom the lake takes its name. This peaceful tribe was conquered and killed by the Iroquois in the 17th century. The land was later peopled by the Ottawa, Wyandot, and Mingo tribes. The first European to record Lake Erie was the French trader and explorer Louis Jolliet in 1669. During the War of 1812, Lake Erie played a strategic role, most famously in the Battle of Lake Erie, where Oliver Hazard Perry defeated the British in a sea contest near Put-in-Bay. The victory is commemorated with the Perry Monument on South Bass Island. It has a surface area of 9940 square miles. The average depth of Lake Erie is 62 feet. The maximum depth is 210 feet. There are 24 islands in Lake Erie, nine of which belong to Canada. Among the largest and most interesting islands are Kelleys Island, home of the Glacial Grooves; South Bass Island, home to Put-in-Bay; Johnson's Island, home to a Civil War Cemetery; Canada's Pelee Island; and Middle Bass Island, home to the closed Lonz Winery. Lake Erie is 241 miles long and 57 miles width at its largest points. It is fed Lake Huron and Lake St. Clair via the Detroit River (in the west) and drains into the Niagara River and Niagara Falls in the East. Other tributaries include (west to east) the Maumee River, the Sandusky River, the Huron River, the Cuyahoga River, and the Grand River. Lake Erie creates its own microclimate along its shores (within about 10 miles inland), making this area fertile and popular for wineries, nurseries, and apple orchards. Lake Erie is also well known for its Lake Effect snow storms, the result of weather patterns picking up moisture from the lake and depositing it at the eastern edge, from Mentor to Buffalo, in the form of snow. Lake Erie is dotted with beaches from southern Michigan to New York. Some are sand and some are composed of small rocks. 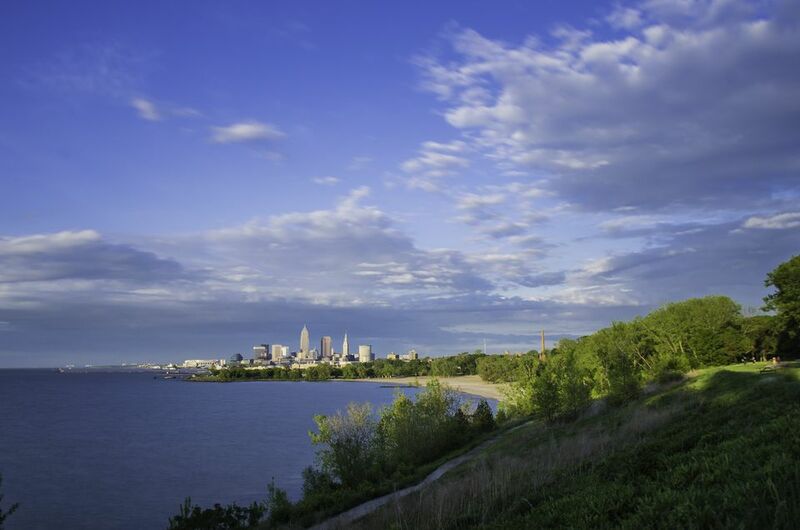 Near Cleveland, some of the most popular beaches are Huntington Beach in Bay Village, Edgewater Beach near downtown, and Headlands State Park, near Mentor. Lake Erie is home to one of the largest commercial freshwater fisheries in the world. Although most of this is based in Canada, a sizeable yellow perch commercial yield is hauled in annually in the United States. Sportsfishing is a popular pastime along Lake Erie, particularly in the springtime. Among the most common fishes are walleye, yellow perch, and white bass. Read more about getting a fishing license in Ohio. In addition to Cleveland, major ports along Lake Erie include Buffalo, New York; Erie, Pennsylvania; Monroe, Michigan; and Toledo.